In this tapestry, just like in its companion piece 'Venetian Gondolas II', we see a scene revealing life on the waterfront city of Venice. Here in this work by Marcelo Silva we see a series of gondolas lined up outside a canal front home, ready to transport people or goods across the city of canals. Ever since its conception, Venice has been a city where gondolas, the traditional rowing boat, has been used to transport cargo, or to ferry residents and tourists across the Grand Canal, or even for gondola races. Life on the lagoon where over 100 islands and over 100 canals weave the city together is richly portrayed in this tapestry. 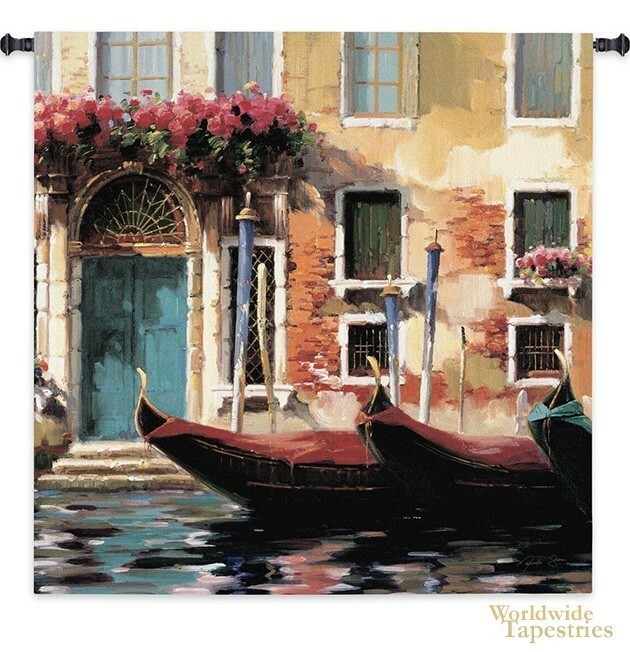 Life in Venice has been associated with romance and this is suggested further by the abundance of flowers along window balconies that can be seen on this tapestry here. The uniqueness of life on the water comes to life in this tapestry by Marcelo Silva. This tapestry is backed with lining and has a tunnel for easy hanging. Note: tapestry rod and tassels, where pictured, are purchased separately. Dimensions: W 53" x H 53"